Hotel Overview Location: Elitsa Hotel is situated at the beach, near the natural reserve "Baltata". Accommodation: The capacity of the hotel is 161 double, 9 single and 6 apartments. The rooms are standard with own bath and WC, telephone, satellite TV. Fridge and personal safe are offered as additional services. Guests of the hotel can use the outdoor swimming pool, restaurant, lobby bar, pool bar, massage by the poolside, bar, safe, currency exchange, parking. 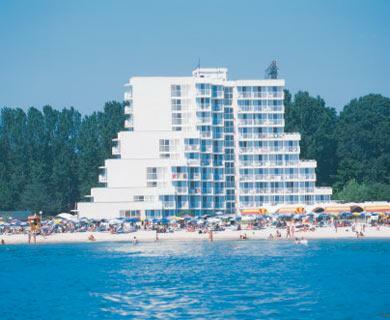 I was this month few days ago in Elitsa and i am very disapointed from this hotel!! Me and my boyfriend got very bad virus and flu with terrible simptoms i was there just 4 nights and when i told the manager and the stuff they told us that this is normal and everybody has that also the kids so i was very scared...We spend 30 euro for pills and they didn't say even Sorry for that only bad attitude!!! Also we bouth internet card for 6 euro -2 hours only but this card didn't work at all in this hotel so we had to go with the laptop to another `hotel and we were able to use it just for 20 min when we asked for our money back at least for that card the Manager sad that she can not give us back once we opened!!!! Very bad policy with the customers and no respect at all,they ask only for money and nothing else so think about if you want to go and stay sick in your room 2 days and when you ask for your rights there will be nobady to help you!! I am Bulgarian but this is not the way to treat the people when they pay a lot for the service!!! Also the hotel is old and not very clean doesn't look like the pictures on-lain !!! I am saying the truth so the other people now what to expect!!!! My name is Besnik Berisha. I have been in your hotel in August 2002. I had great time there. I am interested to know if any of the staff that used to be there at the receptions desk are still working for you, because I would like to see them again when I came there.